Dinosaurs don’t have dinnertimes, so they must get hungry. Dinosaurs love to make a terrible mess. They don’t have bath times, so they must have dirty ears. Dinosaurs don’t wear pajamas, so they must get very cold. Dinosaurs don’t play nicely. Dinosaurs don’t drink their milk. They don’t have bedtimes, but they do close their eyes and curl up and get a good-night kiss. Sticking close to the dinosaur theme, Dyson packs a lot of action into the beautiful illustrations. Mo, the little boy, always wears dinosaur-themed clothes plus, often, dinosaur heads and paws. He’s always followed by his dog Rex and plenty of dinosaur toys. He even has a bandage on his knee. Best as a read aloud, this can also be used by first graders for independent reading and increasing literacy skills. 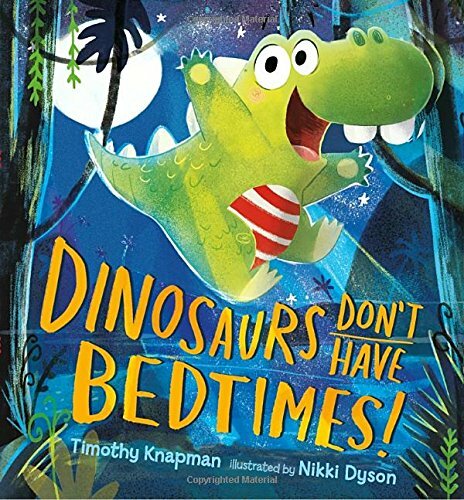 Title: Dinosaurs Don’t Have Bedtimes! As usual, Klassen says a little in very few words. Two turtles find a hat. They find it together. It looks great on each of them, but there’s still only one hat. One hat. Two turtles. Not right. 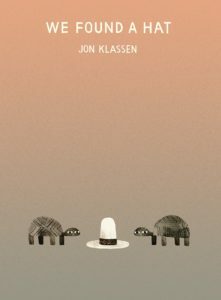 One turtle realizes the fair thing to do is leave the hat and forget about it. They walk away. The other turtle looks back with longing. Together, they enjoy a sunset. The first turtle claims to be thinking about the sunset. The second turtle says it’s thinking about nothing, but still looks back at the hat. It’s time to go to sleep. They discuss their dreams. The first turtle has a dream where each of them has a hat. The second turtle goes to sleep and dreams the same dream. The stark nature of Klassen’s illustration gets the point across that this is a very simple message. Kids will probably note right away that one turtle has square markings, while the other has triangular markings. Simple, but different. They will see that friends share everything, possibly even dreams. This would make a great read aloud to stimulate discussion of friendship and sharing. Independent reading would certainly reinforce literacy skills. There is a lot to love in this book. 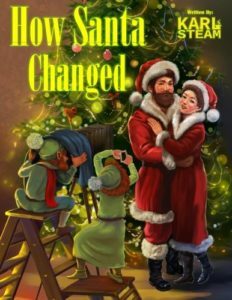 Fall in love with this heartwarming tale almost as quickly as the boy falls in love with his new dog. When a young boy and his father move into a new home, the boy asks for a dog. At the local animal shelter, they disagree briefly on which dog is right for them, but the dad lets the son choose, since it will be his responsibility. The first days with Toby are rough, as he is afraid of everything and does not know his doggie manners. 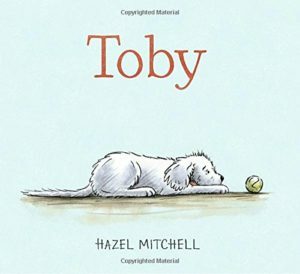 But, gradually, as Toby and his boy learn from each other and form a bond, life gets better. They play together, go on walks, and even hunt for shoes. They learn to sit and stay and make friends. Mitchell’s beautiful illustrations capture the emotions of all three characters. She shows all the actions involved in adjusting to their new life together. The end pages are especially delightful. 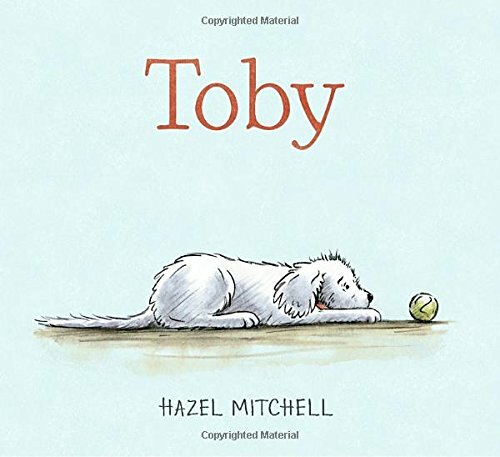 The author’s note about the Toby who inspired this story should encourage people to visit shelters and be as loving as the boy in the story. Parents and teachers should be prepared to discuss puppy mills and how they affect different animals differently. Also, discussions about responsibility and training animals may be incorporated. Six-year-old Fiona’s heart is in the right place, but she’s so easily distracted. She is so excited when she is chosen by Miss B to be her best friend Felix’s Birthday Elf. This means she can make a fuss over him and provide the treats to celebrate his birthday the next day. Miss B writes her a nice note for her mother to ask for cupcakes, but she loses the note in the car when she sees a caterpillar. Naturally, there are no cupcakes. To cover her blunder, Fiona makes up a story about being robbed of the treats. Quickly caught in her lie, Fiona must apologize not only to Felix, but to Miss B, the class, and those accused of stealing. Fiona feels even worse when Felix describes how much he was looking forward to the cupcakes. Having found the note in the car, Fiona’s mom saves the birthday party. Anything but bran bars! 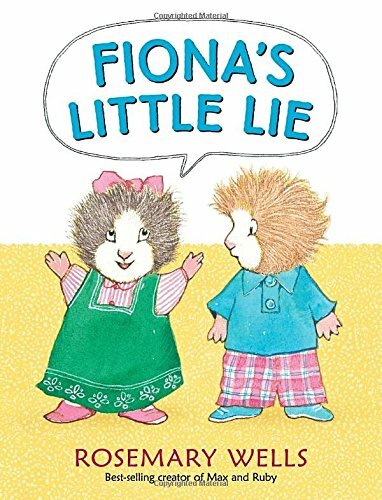 This sweet little book has a lot to say not only about the consequences of lying, but also about the true roles of friendship. Lessons taught, lessons learned. The cute, fuzzy creatures that are Fiona, Felix, and the others add to the fun. How talented is an octopus? As talented as it needs to be to survive all the predators that would love to eat it. 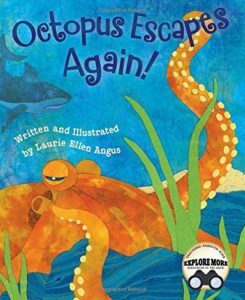 In this informative picture book, the author follows an unnamed octopus as she works to find a meal of her own. First, her quest for shrimp is interrupted by a sea turtle. She hides inside an empty shell. When she spots some small fish, an eel is on the prowl. She escapes due to her ink. Next, a shark closes in, and she shoots away quickly. A large fish grabs one arm. The arm breaks off, and the octopus escapes again. The arm will grow back. A gull tries to get her. She uses her natural camouflage. Finally, she catches some clams for dinner. The many animals highlighted in this tale are discussed in much more detail in the Explore More sections. In addition, the author suggests several interesting activities where kids can learn more – both about the octopus and the other animals present. Some great online videos are also mentioned. The writing is fun and the illustrations give the “being there” feel for underwater adventures. Recommended as the focus for a stand-alone unit or as further exploration related to food chains or sea creatures. Stanley continues his adventures by exploring the world of color. 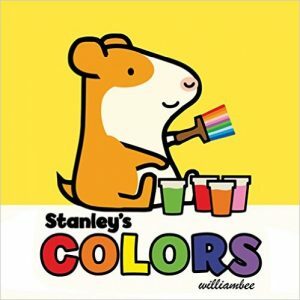 Again, Stanley’s latest exploits are meant mostly for younger children, but the concepts are can also important for children old enough to read the simple text on their own. The theme centers around modes of transportation this time. Each two-page spread highlights one color and where it might appear in the real world. Stanley fixes his red car. He delivers flowers in an orange truck. He rides on his yellow motorcycle. Stanley and Little Woo ride in a green airplane. Stanley fishes from a blue motorboat. His choo choo train is purple. Their hot air balloon is pink. His earth-flattening steamroller is brown. The last very colorful spread combines all the colors, encouraging the reader to explore for colors and combinations. The simple illustrations help make it easier to look for the colors. Stanley has been many places and done many jobs, but now he’s getting down to the nitty gritty. 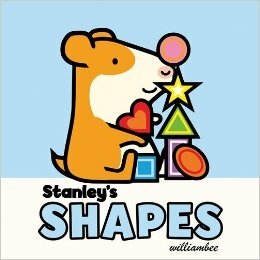 Although Stanley’s exploration of shapes is wonderful for younger children, he can also reinforce concepts for children old enough to read the simple text on their own. Each two-page spread highlights one shape and shows how it’s represented in the real world. Stanley and Little Woo’s suitcases are rectangles. Their tent is a triangle. Hattie’s window is a square. Bicycle wheels are circles. Kites are diamonds. Watermelons are ovals. A starfish is shaped like a star. Cars on a ride are semicircles. The last spread encourages the reader to find the jumbled shapes, which could easily extend to finding those shapes in the world around the reader. Bee’s simple illustrations provide a great and non-distracting backdrop to the idea of exploring simple shapes. In a world where people still question what good math is, this brand new counting book brings counting and color recognition right into the real world. All the children in the text has access to a bowl of bubble gum balls. In turn, each child picks out the balls of the color he or she wants. Cox shows the bowl and lets the reader count the balls of that color in the bowl, among the other colors. The child then blows a bubble matching the ball color and growing progressively bigger with each new number. 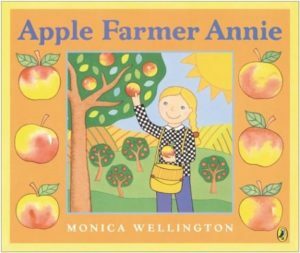 The highly repetitive text is perfect for younger children and makes independent reading a strong possibility, especially for first graders. 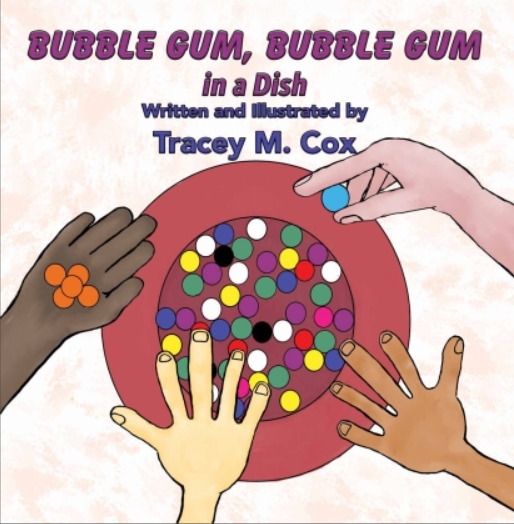 Reading activities can definitely include more counting in dishes. Coins, colored blocks, or jelly beans. The simple style of the illustrations enhances the simple concepts presented in the text. These are concepts that provide a solid foundation for future learning. Even the amusing author photo at the end has a great big bubble the author presumably blew. Do we know how many gum balls she chewed?